Occupy London- Coming together is a beginning. Keeping together is progress. Working together is success. Disappointed by the coverage of the Occupy London campaign, I went down on Saturday 21st October to see the event hosted by the Tent City University, appropriately, outside the Bank of England. The speakers were: Jonathan Portes, Director of the National Institute of Economic and Social Research, Polly Toynbee from The Guardian, James Meadway, Senior Economist at the National Economic Foundation and John Christiansen, Director of the Tax Justice Network. Carried by the positive sentiment, the thirst for intelligent change, I marched from The Bank of England to Finsbury Square, it turns out to help set up the Occupy Finsbury Square camp. The mood was organisational- there was an immediate call for media, finance, outreach, kitchen, toilets. Do you have a tent? No? Go to information, they can sort you out. And they did. This is the winter of our discount tents. Get there while you can. The School of Oriental and African Studies’ yurt was up within hours. The library was running a book club by Sunday. And the curfew was 12am. I had been told by several people that they had privately, and publicly, had support from the church. The recent resignations prove this. I was also pointed towards the members of the Court of Directors of the church. They include Mervyn King, Head of the Bank of England, the Managing Director of Lloyds and the Head of the Financial Services Authority. This information was described today by Simon Jenkins in the Evening Standard as ‘desperate attempts’ to portray the church as in the pocket of the banks. 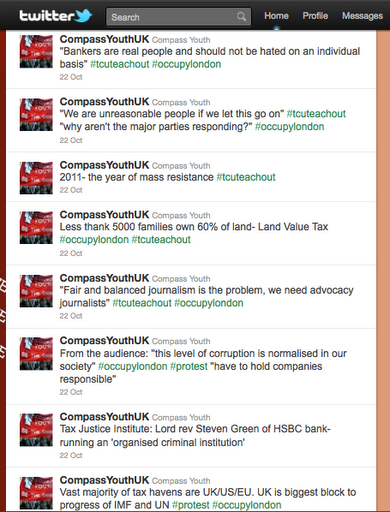 But the polarised messages and threats of eviction, ‘controlled’ by PR firm 33rpm, at least indicate some influence. So 20 days later, I am still disappointed by the things that are grabbing headlines. A fortnight ago and much coverage to date focuses on the ‘first closure of the Cathedral since the Second World War’. To the Standard’s credit, they recently revealed that St. Paul’s also closed in 2003, on health and safety fears about cleaning chemicals being used. He says that change needs to come through ‘political action’ but the Conservatives have conjured Mammon, the biblical symbol of greed, and Labour remain desperately silent. ‘Obey the law’ he implores. Occupy London has so far been a peaceful, exemplary public protest in a public space (save some land that might be owned by the Corporation) that sounds quite reasonable to most people. Forty-four per cent of Londoners answered in a YouGov poll that they support the aims of the group; 30 per cent oppose it and 25 per cent answered ‘not sure’. He calls for ‘regulation of public debate’, a bureaucracy largely ensured in our representative democracy anyway. The campaign, he believes, ‘appeases student idiocy’. The student idiocy that means our services are being cut, our education is being privatised, where standards haven’t improved and that now sees a million of us unemployed. If only the voices during the protests and marches had been heard. Lots of good that march did. Maybe it is just our ‘student idiocy’, throwing caution to the wind in our naïve sense of idealism, that has shown us that previous methods to take part in public debate haven’t made one bit of difference. Buried deeper in the paper is a comment from Anthony Hilton, a veteran business journalist who has worked for the Observer, the Daily Mail and the Sunday Express. He addresses some of the issues that have been missed in the ‘debacle’ that has been the handling of a public protest. This is about injustice, the rewards of globalization that have not been evenly shard, an unequal society, the gulf in incomes, the gulf in values. And the debate about what kind of society we want to live in. The headlines last week about the 50 per cent rise in earnings of FTSE 100 directors only seek to emphasise the merits of the campaign. This ‘rage against the rich’. Hilton highlights that during the unrest of the Thatcher era, the church had no problem speaking out in support of those most in need. The Archbishop of Canterbury ‘took it as a badge of honour to incur the displeasure of the Prime Minister’. The City needs to ‘take responsibility’- with ‘direct engagement and negotiation’- something that has been happening in the Occupy camps from day one. I’m no fan of the Guy Fawkes masks, which Simon Jenkins gaffaws at for their apparent religious connotations and have become a sinister icon for use by our favourite news providers. For me, it has to be about accountability, honesty and feeling empowered to say you disagree. But in the reality that we have found ourselves: “Man is least himself when he talks in his own person. Give him a mask, and he will tell you the truth,” Oscar Wilde. We will honour men and women who have died in the line of service on the 11th of the 11th, of the 11th. People who died for a better world. I hope we can all silently remember what we are all working towards. On the 12th, the annual Lord Mayor’s show will take place with the parade, attended by the Queen. Maybe this could be an arena for public debate. The meeting outside the Bank of England ended with collective support for a People’s Mayor to run in 2012. Anyone who wants to make a difference should put their hats in the ring. This entry was posted in 2011, London, Occupy London, politics, protest on November 2, 2011 by kirstystyles1.